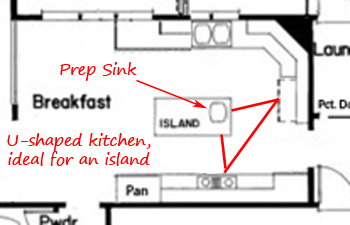 Islands and peninsulas can both provide some extra space in your kitchen. Here's how to choose the approach that works best for your layout, and the things you want to accomplish. 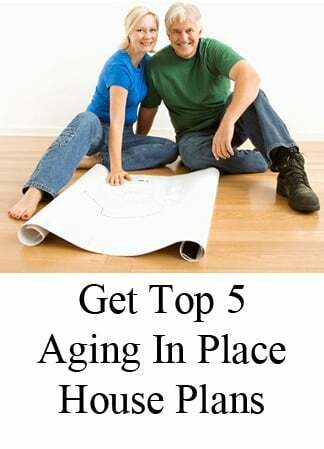 - In larger kitchens, there can be more flexibility for islands - including a place to sit. 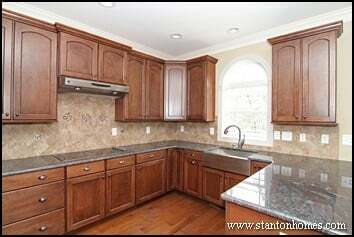 - In smaller kitchens, peninsulas may provide a larger work area, with more conservative use of space. 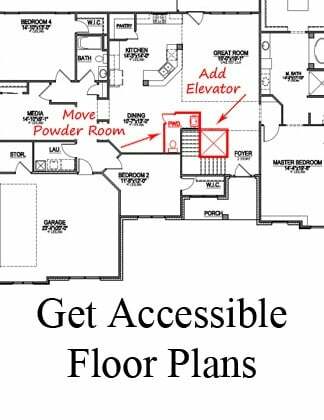 Kitchen floor plan designs are commonly based on the principle of the "work triangle." A work triangle is defined by the number of steps required between the sink, cooktop, and refrigerator. The goal of a work triangle is to create ease of movement - especially when there are multiple cooks. 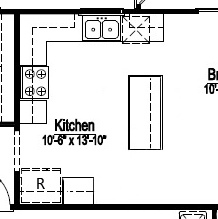 When are kitchen floor plans with an island a good choice? When you want a lot of open area. As a general rule, if there is one cabinet wall of 12' or greater (with a 45 degree angle into another cabinet wall), the functionality of the kitchen is improved with an island. 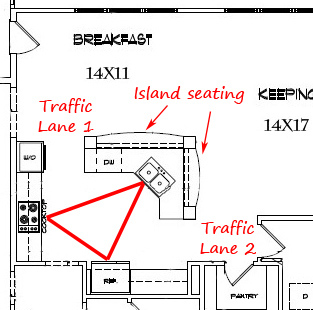 An island allows twice the access to the long wall that is 12' or greater - with two traffic lanes. So, in addition to the benefits of the island, itself, it can also make the dynamics of the room more appealing. 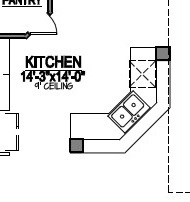 The kitchen floor plan pictured here is large - roughly 14x10 feet - with two long cabinet walls and an angled island with seating. 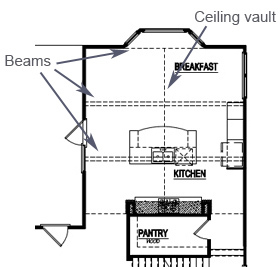 This kitchen would be too large to integrate a peninsula, which would cut off a major point of access. 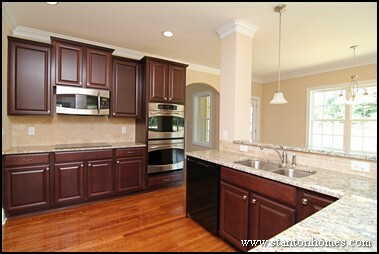 Click here to see more photos of this custom kitchen floor plan. 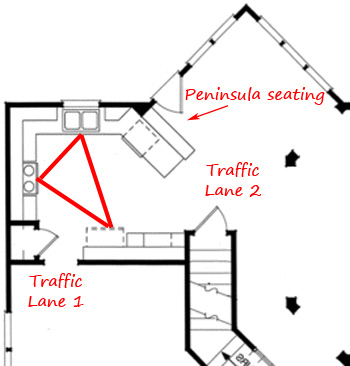 When are kitchen floor plans with a peninsula the best choice? 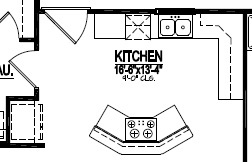 It is best to include a peninsula when your kitchen is smaller, and cabinet and counter space are at a premium. In a kitchen this size, a peninsula will usually allow space for more cabinets and greater square footage of counter top than if you divide your kitchen space to include a small island. 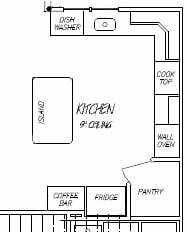 In this kitchen floor plan design, there are spacious, distinct work areas and maximized counter tops and cabinet space. 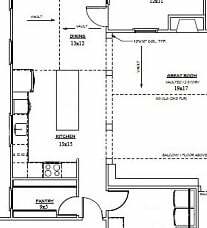 There are also many efficient and convenient kitchen floor plans with an island that do not have a perfect work triangle design. But you can create one - by adding elements such as a prep sink to achieve a flexible kitchen layout. The flexibility to create your kitchen with everything just the way you want it is one of the top reasons to use a custom builder. 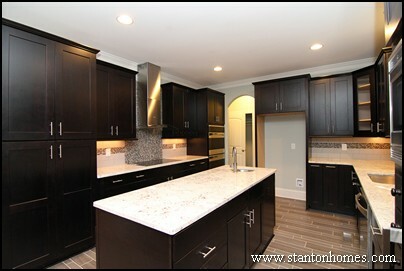 The nation's top builders, such as Stanton Homes, provide design teams who can help personalize your kitchen. 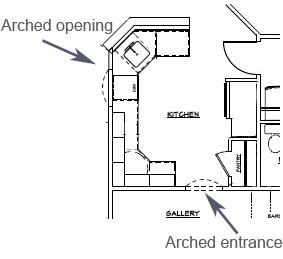 Ask what we can design just for you, to get an idea of the benefits of islands and peninsulas. Shape, size, color, materials and all the things you can tuck underneath can form the personality of your kitchen. 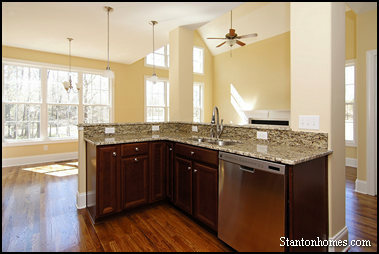 Get ideas from these kitchen floor plan transformations, designed by Stanton Homes to fit your lifestyle. 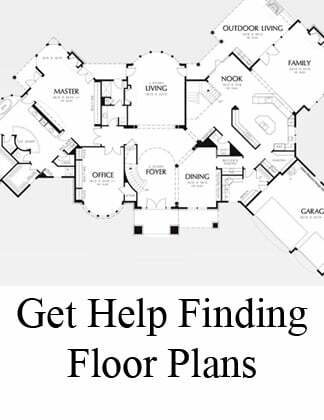 Whether you plan to tuck an island or peninsula into an existing plan, modify it, or create something new, take a look at these real life examples and let us know what we can do for you. 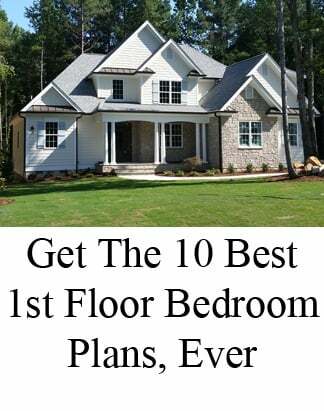 Click here to contact us now or call 919 278 8070 to talk about the custom home you want to design and build. You’ll find out fast why Stanton Homes was selected as one of the top builders in the nation by Professional Builder Magazine.